Another Beautiful Day in Paradise. There were only two overpasses if we went North and many more if we went South. Naturally we went North. Some made it to East Bay and some made it only to Taylor Park. Dee indicated the East Bay group did 12.8 miles and the Taylor Park group did 11.8 miles. 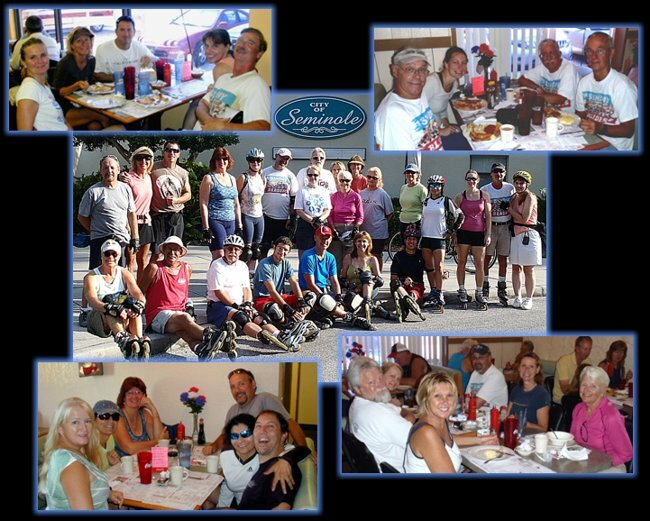 We had 4 new people today: Jim and Lucille on bicycles and Wayne and Judy on skates. Absentees Deb D, Kim F and Sarah P joined us again. Barbara and Karen B joined us again. Welcome all. The newly paved trail was wonderful to skate on and it seemed like we had more shade than I remember. A very pleasant skate. We had 7 bicyclists. We Brunched at Doe Does as planned. Deb B joined us for Brunch. Doe Does was packed as usual but it only took about 5 minutes or so to get us all seated at 4 different tables. Our table got good service with lots of coffee. We got in and out within an hour. Some how I missed Rob's rating but several others gave Brunch a 9.5.